Because everyone could use a little something to brighten their day. [post_ads]This viral dog video was reportedly posted to Instagram back in 2016 by user "carmenlightning," but it was uploaded to Reddit three days ago and is making rounds again with thousands of shares and comments. 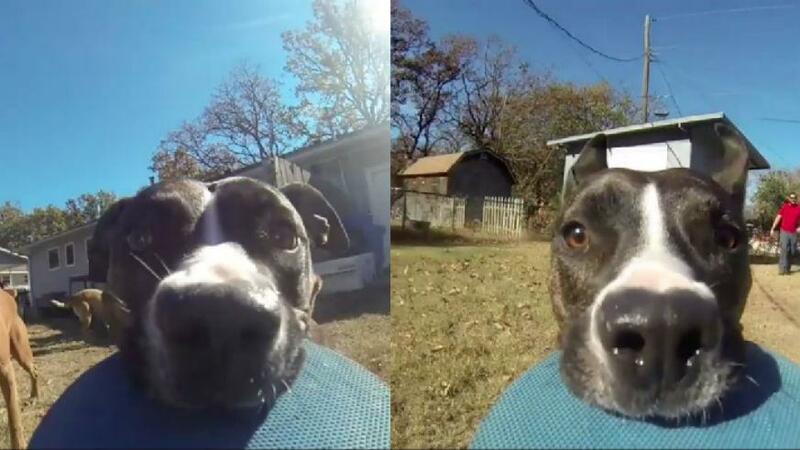 On Reddit, the footage is entitled "The only reason we have a GoPro" and showcases an adorable pit bull named Bonnie. "Just to clarify, this is Bonnie, our almost annoyingly perfect little pitty," carmenlightning wrote. "We rescue and foster dogs frequently and we found her starving and abandoned. She has come a long way and has never looked back. We love our little BonBon." If you thought the concept of dogs with cameras was groundbreaking, just wait until you see what dogs with GoPros can do. After watching, don't you think dogs with GoPros deserve an award (or some extra snuggles)? Most people thought so. [post_ads]Bonnie’s facial expressions are priceless. As one Reddit user commented, "The eye movements are hilarious! So adorable." "I could watch those ears flop around for hours!" another wrote about the viral dog video. A third pointed out that "she has a great sense of comedic timing," waiting until the other dogs catch up with her before slyly speeding away. It’s impossible not to smile seeing dogs with GoPros do their thing. As another Redditor noted, "My heart feels good after watching this." Agreed.